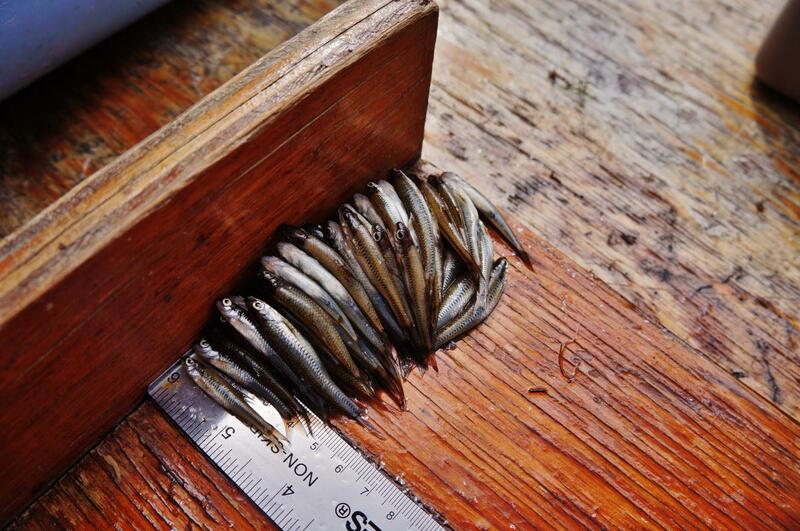 Research findings at IISD Experimental Lakes Area (IISD-ELA) show that climate change is shrinking our fish. In the fifth and final part of our series about IISD-ELA and climate change, we look at how and why our lake trout are getting smaller, and what role climate change is playing. Lake trout are getting smaller. ​As you can see in Figure 1 below, there have been changes in adult (largest 5 per cent of population) lake trout length over time in three pristine lakes at IISD-ELA. (Length is measured as fork length: the distance from the snout of the fish to the fork in its tail.) In other words, our data are suggesting that your grandpa is right: the large trophy-sized lake trout, prized by recreational fishermen, appear to be getting smaller and smaller over time. Preliminary analysis of our data also shows a long-term pattern in spawning behaviour, where the timing of fall spawning occurs later and later each year. Our working theory for this observation is that changes in the length of summer period, and potentially other effects of climate change on lake trout’s forage base, are creating a pattern of sub-optimal conditions and reduced growth rates over time. If we are right, then, as air temperature and the length of the summer period increase, such changes are likely to continue. Figure 1. 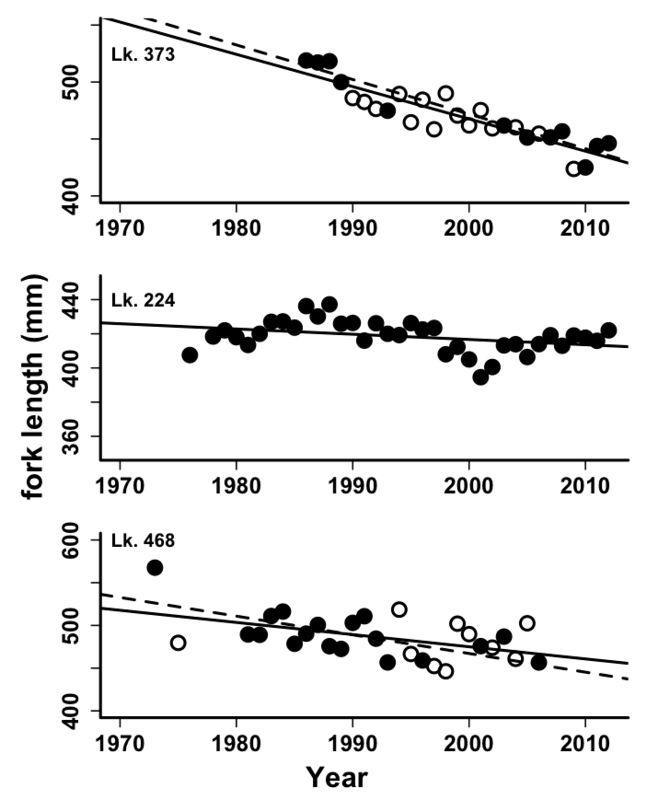 Changes in fork length of adult (largest 5 per cent of population) lake trout over time in three pristine lakes at the IISD-ELA. How can we tell that climate change is the cause? ​One of the challenges in detecting the effects of climate change lies in separating the effects of climate from other effects such as fishing pressure, changes in land use or changes in industrial activity. Fortunately, IISD-ELA has been monitoring lake trout populations since the 1970s in several remote and pristine lakes with no fishing pressurein Northwestern Ontario. In this region, climate change has increased the length of time that lake trout are stuck in the deeper parts of lakes, limiting their access to food in the shallow waters during the spring and fall. However, the boreal ecozone is changing. A history of more intensive land use, industrial development, electricity generation and resource extraction has altered the natural balance in minor and major ways. Most importantly, a changing climate affects water, land and life. Responsible use of our natural resources requires a scientifically rigorous understanding of these systems and how they are changing. Fortunately, Canada’s premier freshwater research station has a front row seat and a history of monitoring parameters that can tell us how the world’s northern forests and freshwater lakes are affected by these changes. IISD-ELA brings a 47-year (1969–present) history of monitoring climate, water quality and fisheries in a unique whole-ecosystem laboratory setting. Now, as a part of the International Institute for Sustainable Development, we have the opportunity to use the long-term monitoring dataset of IISD-ELA to examine how climate change is affecting boreal forests, wetlands and lakes from a consistent, long-term, whole-ecosystem dataset of significant scientific and societal value.